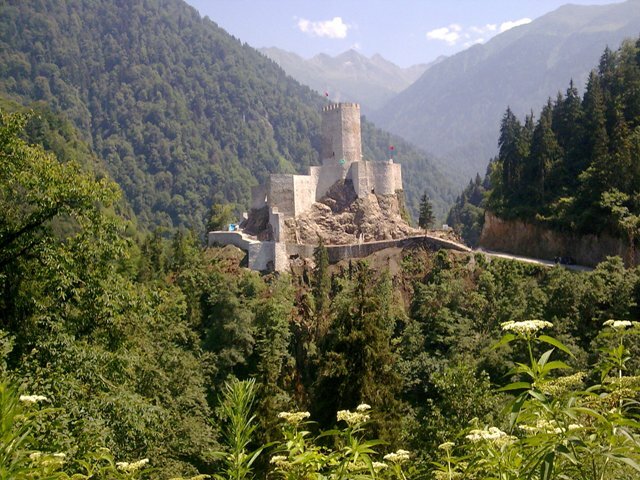 Notes: Zilkale is a medieval castle located in the Firtina Valley (literally: "Stormy Valley"), and is one of the most important historical structures in �amlihemsin district of Rize Province in the Black Sea Region of Turkey. The castle is built at an altitude of 1,130 m (3,710 ft), and sits at the edge of a cliff overlooking the Firtina Creek (Turkish: Firtina Deresi approximately 380 m (1,250 ft) below running at an elevation of 750 m (2,460 ft) southeast of it. The castle consists of outer walls, middle walls and inner castle. There are garrison quarters, and a possible chapel and head tower. It is believed that the castle was built in the 14th-15th century.